The Telescopic Conveyor is an automatic loading and unloading conveyor that is capable of reaching into the containers and trucks. Simple to use, these conveyors increase the loading / unloading efficiencies, as well as removes fatigue from the operators. Telescopic conveyors is a must have for applications like logistics, shipping, distribution centers and warehouses. Telescopic Belt Conveyors are ideally suited for loading and unloading boxes / sacks / tyres / other products into different sized vehicles - from a small van to a truck. The advantage of the Telescopic Belt Conveyor is that the length of the conveyor can be electrically extended or retracted telescopically. This ensures that the loader/unloader can work comfortably throughout the length of the vehicle. Using a Telescopic Belt Conveyor significantly minimizes the number of loaders, enhances the efficiency of loading / unloading into the vehicle thereby minimizing fatigue. Besides reducing the number of operators doing the job, it also increases the throughput, enabling quicker turnaround of vehicles. 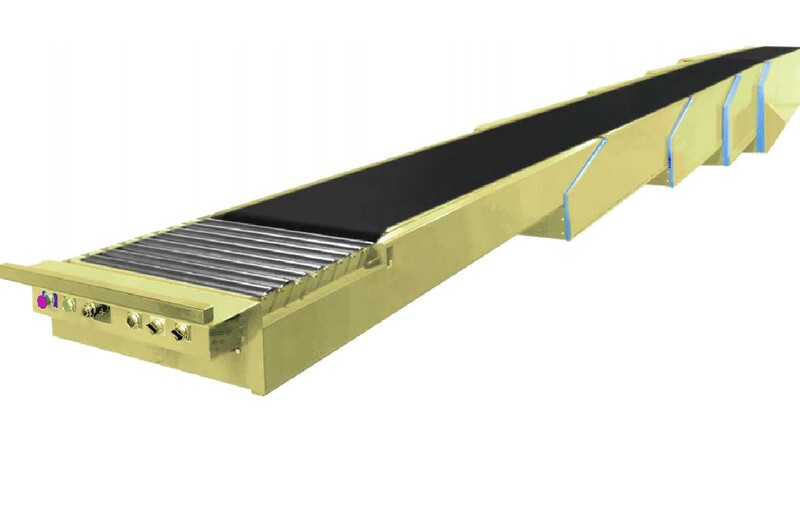 The conveyors come in two standard widths of 600 mm or 800 mm. Length of such conveyors can be custom selected depending on the specific application. The ability to hydraulically tilt the conveyor to an incline is available as an option depending the need of the application, which could further enhance the operators efficiency.